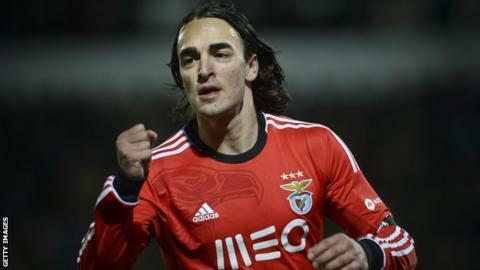 Liverpool have completed the £20m signing of winger Lazar Markovic from Benfica on a "long-term deal". The 20-year-old helped Benfica win the Portuguese title last season after joining the club from Partizan Belgrade in the summer of 2013. "I hope that I will fulfil the expectations of the supporters, coaches, players and all connected to the club," he told Liverpool's website. The Serbia international becomes the club's fourth signing this summer. "He's a player with a rare talent. The raw potential is absolutely enormous. If he can progress at the present rate he's going to be worth twice the money that they paid for him in 12 to 18 months' time, so it's a good investment." Liverpool have already signed striker Rickie Lambert, 32, for £4m and midfielder Adam Lallana, 26, for £25m, both from Southampton. Germany Under-21 midfielder Emre Can, 20, has also moved to Anfield, joining from Bayer Leverkusen in a deal worth £10m. Markovic scored seven goals in 49 appearances during the 2013-14 campaign as Benfica sealed a domestic treble and reached the Europa League final. "I have seen what the players are like, I have seen what the supporters are like, and I cannot wait to start playing here," he said. The Reds are also waiting for a decision from Divock Origi, having agreed a deal for the 19-year-old striker with his French club, Lille. Origi was part of the Belgium squad that reached the World Cup quarter-finals, scoring their winning goal as they beat Russia 1-0 in Group H on 22 June. If he decides to move to Merseyside, he could cost the Reds £10m with add-ons but will return to Lille on loan for the 2014-15 campaign. Liverpool, who are selling striker Luis Suarez to Barcelona for £75m, are attempting to strengthen their squad as they prepare to compete in the Champions League for the first time since 2009 after their second-placed finish in the Premier League last season. The Reds are also keen to sign Southampton defender Dejan Lovren but have had a £20m bid rejected. Who is doing what in the transfer window? Read more on Premier League transfer window: Who is doing what?